Please click on the relevant topic for more information. For additional questions, please contact shanghai.studentaccounts@nyu.edu. * Once accepted, you should confirm your participation in the program by paying the non-refundable confirmation fee of $500. This fee will be applied towards your tuition. *** Confirmation Fee: One time non-refundable confirmation fee of $500. This fee will be applied towards tuition. This applies to the Non NYUSH students studying in SH. *All books and course materials will be available upon your arrival to Shanghai. 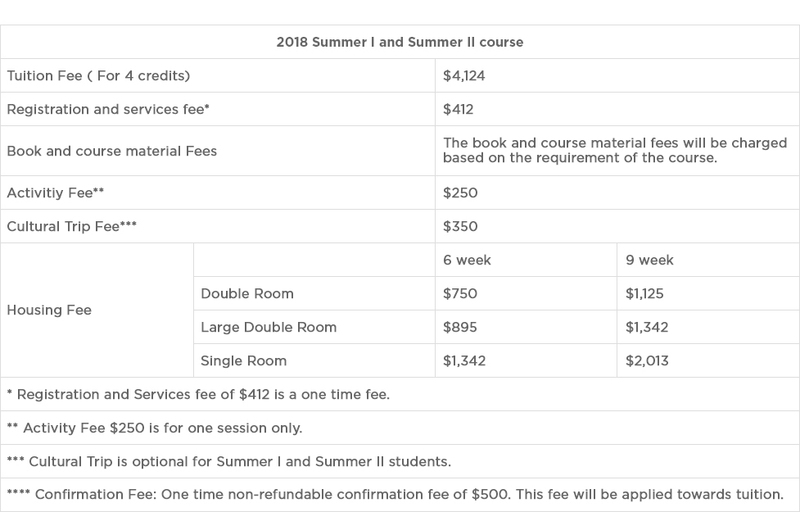 A flat fee of $250 will be charged to all students for summer session books . However after the first week of courses, the book fee will be adjusted to reflect the actual book fee for your course(s). *** May 2, 2017 Cancel Summer Session 1 housing w/ 300USD Cancellation Fee. June 14, 2017 Cancel Summer session 2 housing w/ 300USD Cancellation Fee. $710/Double room, $851/Large Double room, $1,277/Single, $1,525/Apartment Large double room, $1,951/Apartment Style single room.